CTI's Fusion Systems International has implemented advanced prepress systems integration for the printing and publishing industry on a national level for the past 20 years. We provide quality management services, systems automation and training, plus our clients receive exceptional after-sales support, making them repeat customers as their businesses grow. Today’s production environment is rapidly evolving. Print production is consolidating, print and digital production are starting to merge, and more work needs to be completed in less time with fewer resources. Automation is the key to managing this dynamic. Fortunately, Fusion Systems International offers the most cost-effective means to easily automate a wide range of time-consuming and repetitive tasks to help you to work smarter. 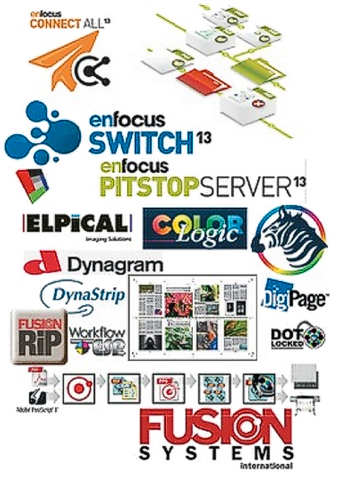 Fusion Systems International is a leading provider of Mac OS X and Windows Harlequin RIPs along with advanced prepress solutions for print and publishing professionals. Add automation across multiple departments to save hundreds of man-hours. improve quality control and maximize your team’s productivity. to your required naming convention; automate pre-flighting and file correction, sorting, routing, and so much more. enhancement (both print and electronic editions), and E-edition content publishing. The possibilities are amazing! by requesting information or a workflow demonstration.